In a world where "connectedness" is a prevalent theme for future-focused learners and learning, understanding what is happening at a global level becomes important, and making connections with others in other parts of the world an essential part of that. Increasingly, teachers I work with are finding ways of using digital technologies to mediate connections that provide authentic learning opportunities for their students. Stories have the power to cut through rhetoric, data points, and policies to show what globally connected learning truly looks like – the successes, challenges, and everything else. The map above is curated by Digital Promise Global and links to stories that are submitted by people from around the world. Digital Promise Global launched the Global Story Map to showcase stories from educators, schools, and programs that support global learners. Start exploring stories here. If you have a story worth sharing then add it to the map. Continuing with my learnings from the DEANZ conference in Christchurch – we've been hearing a lot about how the use of open, flexible and distance learning strategies can assist in achieving global connections that lead to meaningful and pursposeful change for a better world into the future. One of the morning's speakers has been Dr Jonghwi Park, programme specialist in ICT in Education at UNESCO Bangkok. She provided us with an excellent overview of initiatives that are in place to address UNESCO's Millennium Development Goals, with an overarching emphasis on education as a way of addressing this. The importance of engaging with communities from around the world in developing a collective view of what is important and where we should expend our energies (and money) is important here. Dr Park introduced us to the MyWorld2015 initative where individuals can set their top six priorities for change, and then become a part of a global community contributing ideas and actions to achieve this. As New Zealand teachers prepare to go back to school for the new term next week, this site may well be worth bookmarking as a place to take your students as a starting point for some authentic, inquiry-based social action projects. Here's a great opportunity to engage your students and community in a game-based conversation about the future of NZ. Pounamu is a free, online game set in a future world where EVERYONE in New Zealand can use science as easily as they can use a computer now. Anyone can play; from primary school students to research scientists, from young entrepreneurs to kuia and koro. The game will be live on 29-30 August, from midnight to midnight – all you need to do is register now to be able to access and participate. Players post micro-forecasts (concise ideas – 140 characters, like twitter) of future possibilities and build on, or reshape other players’ ideas. You can play for ﬁve minutes and share one idea, or play for the whole game and post hundreds of possible futures. Pounamu will have ’hubs’ scattered around the country on game days, so players who want to play in teams, or don’t have access to the internet, or just want to play in a social environment, have the opportunity to do so. Pounamu is collaboration between the MacDiarmid Institute for Advanced Materials and Nanotechnology, StratEDGY Strategic Foresight; and Professor Shaun Hendy, winner of the Prime Minister's Science Media Communication prize and author of Get Off The Grass which he wrote with the late Sir Paul Callaghan. Having recently spoken in Hamilton about the Ten Trends at a CORE Breakfast my mind is already thinking forward to what lies on the horizon for 2013, so it was with interest I read this morning the latest McKinsey report on Disruptive Technologies: advances that will transorm life, business, and the global economy. What I like about the McKinsey report is that it attempts to look beyond the usual hype and speculation that comes with an emerging technology, and dig a little deeper to examine the potential impact of that technology, why they consider it disruptive, and what both the benefits and challenges may be. The report identifies twelve disruptive technologies, and provides a very useful analysis of each – supported by clear and easy to interpret graphics that make the task of digesting all of the information that much easier. The image below is captured from the pop-up gallery of disruptive technologies that can be accessed from the web site. 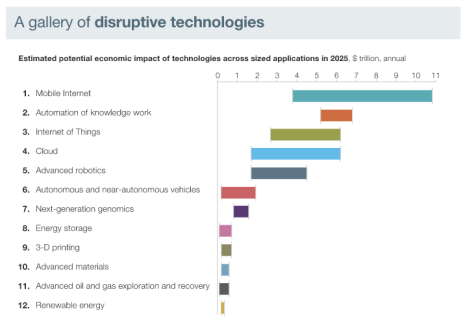 It lists the twelve technologies that are examined in the report, showing the estimated potential economic impact of each. The technology is rapidly advancing or experiencing breakthroughs. Disruptive technologies typically demonstrate a rapid rate of change in capabilities in terms of price/performance relative to substitutes and alternative approaches, or they experience breakthroughs that drive accelerated rates of change or discontinuous capability improvements. The potential scope of impact is broad. To be economically disruptive, a technology must have broad reach. Significant economic value could be affected. An economically disruptive technology must have the potential to create massive economic impact. Economic impact is potentially disruptive. Technologies that matter have the potential to dramatically change the status quo. The biggest challenges for policy makers could involve the effects of technologies that have potentially large effects on employment. By 2025, technologies that raise productivity by automating jobs that are not practical to automate today could be on their way to widespread adoption. Historically, when labor-saving technologies were introduced, new and higher value-adding jobs were created. This usually happens over the long term. However, productivity without the innovation that leads to the creation of higher value-added jobs results in unemployment and economic problems, and some new technologies such as the automation of knowledge work could significantly raise the bar on the skills that workers will need to bring to bear in order to be competitive. With the world of work predicted to change so markedly, it's simply no longer acceptable to sit back and us the nature of our assessment and other excuses as reasons for no pushing forward with a more future-focused view of our curriculum and how we present it. As educators we need to be thinking more critically about the offerings we provide in our curriculum, and just how seriously we take the 'front half' of our (NZ) curriculum framework that deals with key competencies, for example. Do we truly understand and have grappled with the implications of what it means to 'raise thebar' on the skills that workers will need to bring to bear in order to be competitive? What does this mean for our students? what does this mean for the current and next generation of teachers in their own professional lives? In our vision for the students in our schools currently, what is the emphasis we give to creating 'knowledge workers' for the future? Do we have an accepted understandin of what that means? How do we assess this? As we move towards a more knowledge-based economy, with greater levels of automation of how do we avoid the consequent potential for unemployment and negative economic impact? I've just been engaged in a workshop with a group of teachers considering the issue of globalisation and the concept of global citizenship. Such issues are a significant focus of the The New Zealand Curriculum which has Future Focus as one of the 8 principles. 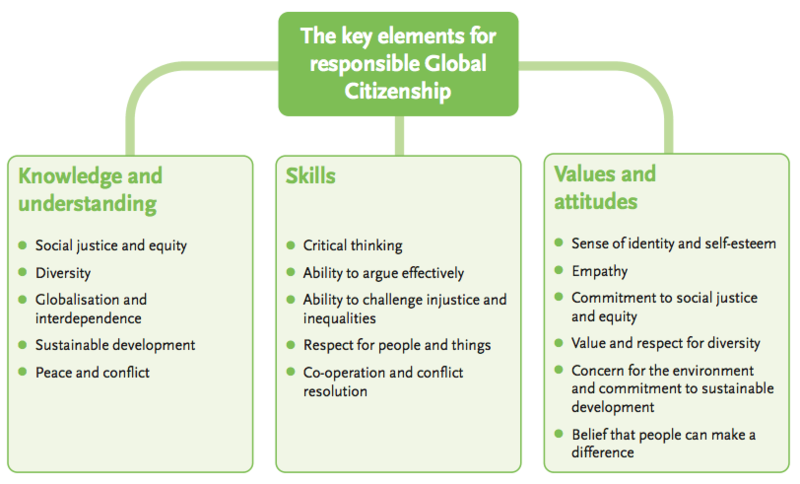 Globalisation and citizenship are two of the four issues that this principle focuses on. Future focus is about supporting learners to recognise that they have a stake in the future, and a role and responsibility as citizens to take action to help shape that future.’ (NZC page 9). "This (future focus) was the least evident of all the principles at school curriculum level in classrooms’ curricula. It had not been adequately examined and discussed with teachers by school leaders and therefore most of its aspects were not understood. There continues to be some confusion amongst teachers about the relationship between future focus and 21st century, or e-learning, and lifelong learning. In terms of the imperatives we are facing of preparing our young people for a future that is uncertain, and one that is increasingly globalised, we, as educators have a huge responsibility for ensuring our programmes are designed to prepare students for their future, not our past. Not as easy as it sounds – an obstacle being a lack of awareness and information about what the nature and impact of globalisation is or may be. Online universities have just published a post titled 14 Best Books About Global Education which profiles fourteen titles that are worth adding to your reading list. I'm familiar with only four of them, so looks like I'll have some more to explore! Would love to hear from others who have read any of these and who can recommend them. 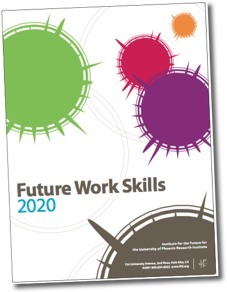 My colleague at CORE, Jedd Bartlett sent me a link this morning to the Future Work Skills 2020 report from the University of Phoenix – very timely as I'm preparing for a talk in a few days where I will be speaking about a future focused approach to preparing our learners in schools. New media ecology: New communication tools require new media literacies beyond text. Superstructed organizations: Social technologies drive new forms of production and value creation. Globally connected world: Increased global intercon- nectivity puts diversity and adaptability at the center of organizational operations. (b) in terms of the very nature of schools as insititutions and the work practices that define them. Difficult to imagine how such competencies can be addressed in our current school system without a significant re-think in terms of our curriculum, our pedagogical practice, our operational systems and structures. The question remains – "are we preparing our students for their future… or our past?" In a fast-changing and interdependent world, education can, and should, help young people to meet the challenges they will confront now and in the future. Oxfam believes that Education for Global Citizenship is essential in helping young people rise to those challenges. Now this is only an approximation of thought – but does begin to illustrate that Global Citizenship, empowering young people to act for a more just, secure and sustainable world, need not be considered just an 'add-on' or 'extra' to be addressed when the 'real' stuff of the curriculum has been dealt to. We owe it to our young people to ensure they are adequately prepared to take a responsible role in the increasingly globalised world that they will participate in as they move through school and on into the workforce. With an increasing emphasis on the use of film and media in schools it’s always useful when there’s an opportunity to put those talents to good use as part of a challenge or competition. The NZ National Commission for UNESCO is a project partner in the Outlook for Someday sustainability film challenge for young people aged up to 24 years, making it idea for consideration at the senior secondary or tertiary level. The challenge is to make a short sustainability related film, in any genre, filmed with any camera and at any length up to a maximum of 5 minutes. Entries can be from individuals, teams, schools, groups of friends etc., so the door is open to all sorts of collaborations. Full details can be found on the Outlook for Someday website – entries close on 17 September.